[SIGN UPS CLOSED] Anti-Procrastination Course: Eliminate Procrastination, Take Massive Action. Register Now! Are there areas of your life which you’ve been procrastinating on, such as losing weight, starting a new business, working on your new business, improving your eating habits, studying, and more? Do you wish to STOP procrastinating and take MASSIVE action on your goals? My latest run of Anti-Procrastination Course will be starting Sep 12, Saturday. For those new to the course, read more below. To head straight to sign up, scroll to the bottom of the post! In school, I would put off studying for exams, studying only at the very last minute, or sometimes not studying at all. With assignments and projects, I would put off doing them because I hated doing them. I regularly spaced out during class, sometimes even skipping school altogether. During school vacations, when my friends were busy getting vacation jobs, I deliberately avoided doing so because I wanted to relax. I thought it was stupid to work during the holidays because I had the rest of my life to work. I scoffed at the notion of being a hard worker. In health and fitness, I wanted to lose weight but I kept playing lip service to exercising and eating right, instead skipping exercise sessions and eating junk regularly. I also procrastinated on my goal of finding a partner even though deep down, I wanted to be in a relationship. Such procrastination behavior left me scrambling (and very stressed out) whenever there were deadlines. In school, I was so desperate that I would put the textbook under my pillow as a last ditch attempt to “absorb” the information in time for exams (it didn’t work obviously). Not only that, procrastination negatively impacted my results. For example, studying at the last minute left me with lousier grades than I could have gotten since I didn’t have time to study everything. Having lousier grades affected my choice of schools and also the opportunities I got in school (students with better grades are obviously given special attention, put on special tracks). And who can forget the long-term, Quadrant 2 goals that would never become urgent? Because goals like exercising, eating healthy, achieving my ideal body, finding love, etc. are “good to have” goals that are very difficult to achieve or take too much time to do so, I kept putting them off. The problem, though, is that such goals never become urgent until it’s too late. For example, not eating healthily will cause irreversible health problems when one gets older. Putting off one’s passion leads to greater inertia as one becomes settled in their career and life. Putting off on love, marriage can lead to a problem later on where one is unable to start a family even when they want to. Then, things changed. Starting from my late teens, I became a natural go-getter. 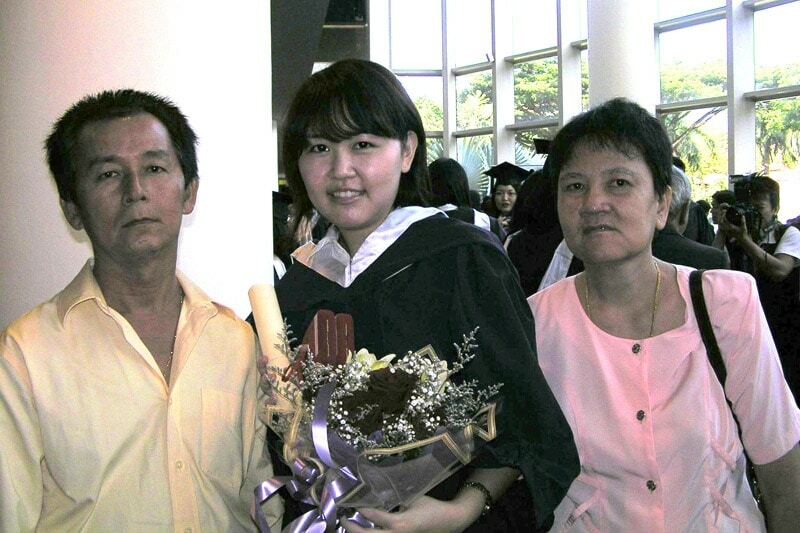 During my university years, I studied in NUS Business School, one of the top business schools in Asia. I was the Dean’s Lister (an honorary roll for top performers) every academic year and eventually graduated as the top student in my specialization of Marketing. During my graduation, I was awarded with 2 gold medals — Chettiar’s Temple Medal and Ban Hin Leong Gold Medal — honors bestowed to the most outstanding student, as determined by the school’s board. When I discovered my passion to help others grow, it didn’t take long before I quit my corporate job to start my personal development blog/business right after — without any experience in coaching. I was only 24 then — an age that most (at that time) would consider premature to pursue one’s passion. Through consistent action taking though, it was merely months before I built quickly built my skills, drove awareness, and established credibility for my work. My business, Personal Excellence, promptly took off. 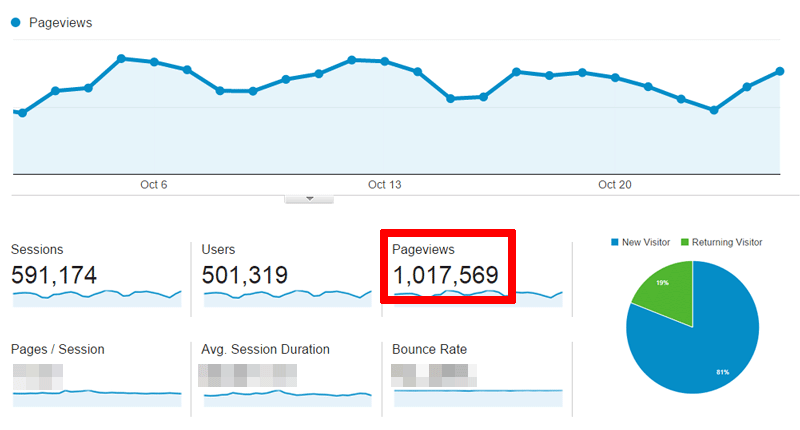 Today, PE is one of the top personal development blogs in the world, with over 1.1 million pageviews every month (we are on track to hitting 1.2 million pageviews, an all-new monthly high, this month!). I’ve coached/trained over thousands of individuals to personal success and have been named as one of the top 30 coaches in the world by Coaching Gurus International. I’m regularly invited to speak at conferences and events, having spoken at Wharton Business School, Dove, Kimberly Clark, Ministry of Defence (Singapore), JobsCentral, NUS Global Alumni Network, National Library, Great Eastern, People’s Association, de Baak, and more. I’ve received over 80 media coverage including CNN, Channel News Asia, Channel 8, and Asia One. Achieving my ideal weight. I tackled my eating issues, prioritized healthy eating, made fitness a staple in my life, and finally achieved my ideal weight. Traveling. In mid-2011, I packed my bags and went on a 7-month travel; subsequently in 2013, I continued traveling to more countries. Over the course of 2 years, I spent nearly 50% of my time traveling, and visited 20 different cities spanning across Europe, United States, Asia, India, and South Africa. Building my passive-income business which allows me to work anytime without having to worry about money. Finding my soulmate, my ideal partner for life (and subsequently getting married last year, 2014). Maybe you’re thinking, “Oh great Celes, you’ve achieved all these goals because you are highly disciplined and motivated. Not me though. I’m not disciplined nor motivated. I get started with something and then give up shortly after that. I’m too lazy and I procrastinate. These goals ain’t for me.” In fact, this is what many people have told me. My continuous action taking has nothing to do with discipline. Since university years, I have considered myself to be the most undisciplined person on Earth. After all, discipline is about forcing to do what you don’t feel like doing — I do not believe in forcing myself to do things that I do not want to do. And I don’t believe you should either. Neither am I “naturally motivated.” Like I shared earlier, I used to be highly unmotivated, from studying, to working, to healthy eating, to exercising, to love. I was not born with naturally high motivation unlike what some would think. The reason why I consistently take action is because I have, in my early years of growth, discovered the key to busting procrastination. I realized that procrastination is simply a surface, symptomatic issue, and when busted at its roots, leads to natural action taking. And this is why I created Anti-Procrastination Course™ — to help others bust procrastination like I have, such that they can take massive action and make big progress in their goals. Don’t take my word for it. Here are real results my participants from previous runs of Anti-Procrastination Course have achieved — some within months of the course, some even during the course itself!! Annette who was procrastinating on her masters for years before the course. She completed and got awarded her Masters in Software Engineering 6 months later. Alyssa C who went out there to buy the property she had been eyeing for 2 years, right after THE FIRST WEEK of the course. Craig Scott, who is currently taking a professional qualification for his career. He moved forward 20% in his qualification after just 4 weeks in Anti-Procrastination Course, when the first 20% took 3 years! He’s now on track to complete his qualification before the end of the year! Sarah T, who finished her PhD — a highly stressful undertaking, something that fellow PhD students will know. Diana Diehl, whose had put her manuscript on hold for 15 years prior to Anti-Procrastination Course. She just finished her manuscript this year, handed it to her illustrator, and guess what: her book will finally be published this year. Alex Kwek, who was procrastinating on making a move in his career. 2 months after the course ended, he landed himself a new job — with a 40% pay rise, a $17,000 USD annual increment over his previous job. Farah Mitri, full-time mom to 2 kids, loving wife, full-time employee in a corporate organization, and carer of the household. Prior to the course she was overwhelmed with many things going on in her life, but through Anti-Procrastination Course, worked out her blocks and took massive steps in her new business in holistic health coaching! 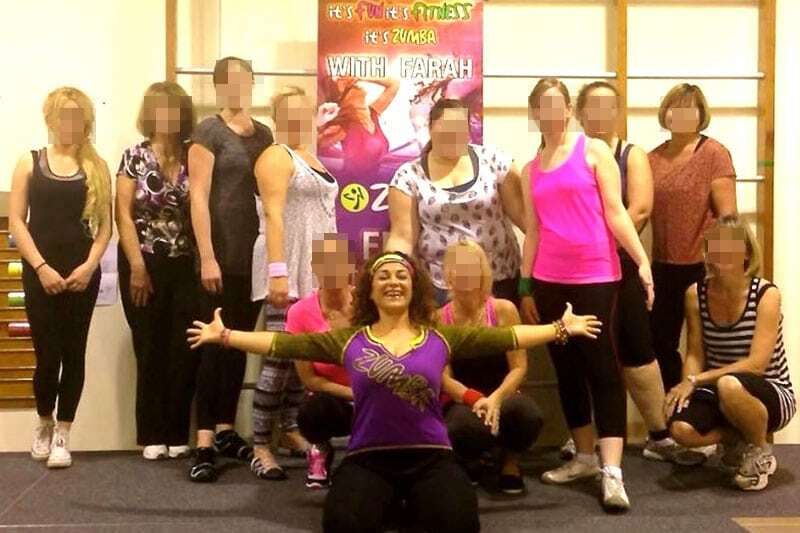 Farah pursuing her passion — here, with her Zumba participants! Nancy Lopez, whose goal was to achieve health and wellness. Through the course, she integrated movement into her daily routine; her clothes fit differently, notably looser; she started eating better; and her family tells she looks better! Gail, who lost 7 lbs in just 2 weeks and got excited about being healthy and achieving her best health for her kids. Boon Kiat, who was procrastinating on exercising and eating healthily before the course. He has subsequently been taking action daily on his goals — scheduling nature photoshoots almost every weekend and taking big steps in his photography business! The most amazing thing is that these individuals ALREADY had the power in them to realize these goals all this while. The Anti-Procrastination Course merely helped them rediscover what’s already there and align to their inner source of power. And I’m excited to do the same WITH YOU in this year’s run! You are ready to take massive action on your goal(s). Through the course, you’ll be working on an important Quadrant 2 goal of your choice. (You can set more than one but I recommend one to kick things off.) It doesn’t matter what your goal is — achieve your ideal weight, start your next business, study, date, work on your blog, improve your career performance, etc. — the principles of this course WILL APPLY. You are not interested in quick fixes. No tips like using a self-timer or color-coding your calendar. We’re here to uncover the root causes of your procrastination and achieve fundamental mind shifts. 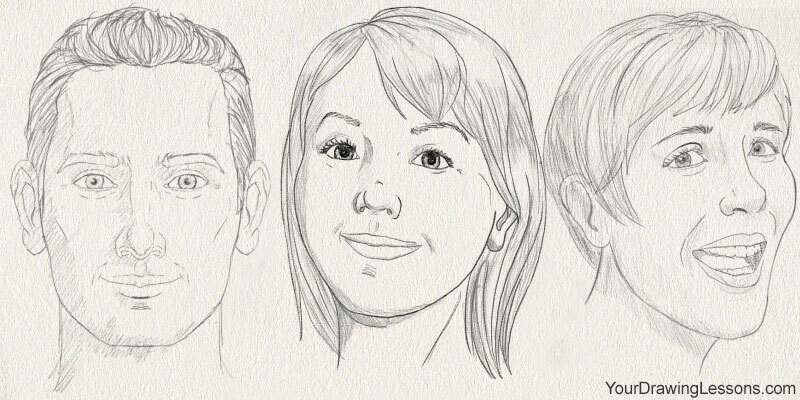 You want to work with the best to bust procrastination. You are ready to take things to the next level. I’ve been coaching since 2008 and have worked with thousands worldwide to bring their life to the next level. I’ve been achieving breakthrough results in my own life since 2003. I ready to work with you in this course. You want a real, tried-and-tested system to tackle procrastination at its root. Anti-Procrastination Course is the summation of my life’s best work on busting procrastination — permanently. If you think the articles on PE are good, this course will bring things to the next level. You just want superficial tips to combat procrastination. Long-time readers of PE will know that I’m not into quick tips, but rather, what truly works. You think that signing up will magically lead to your goals being achieved. OR You sign up but you don’t show up. I want to help you, but if you don’t even show up, there’s little I can do. You expect someone to continually “push” or “motivate” you in your goals. You don’t need someone to motivate you. YOU ALREADY HAVE THE POWER IN YOU. Through Anti-Procrastination Course, you’ll REDISCOVER power that’s already in you, that you can readily tap into to realize your goals. Learn to tap into your inspiration such that you’ll be naturally motivated all the time, without having to force/discipline yourself to take action. This happens right away in Module 1. Uncover your procrastination beliefs keeping you from action, and correct them into action-taking beliefs. You do this in Module 2. Create your “procrastination-proof” environment where you take action 100% of the time. You do this in Module 5. Create your productivity ritual, a routine of daily activities that energizes you, syncs you with your natural flow, and keeps you motivated every single day, such that procrastination no longer becomes an issue. This happens in Module 6. Be the master of your time. Are you always “too busy” and “having not enough time?” Guess what–all of us have the same 24 hours a day, just like Mother Theresa, Steve Jobs, Bill Gates, Oprah Winfrey, and top achievers of the world. Learn to manage your 24 hours a day to achieve the maximum results. Module 7 is where this happens. A complete, proven system to bust procrastination once and for all! Throughout the course, you’ll learn frameworks, strategies, and specific tips to break through your procrastination and take action. The end result is natural, effortless action-taking, NOT a state where you have to constantly discipline and force yourself to act! By the end of the course, you will be a master action-taker! Be prepared for a once-in-a-lifetime course that’ll change your views on procrastination and productivity! * No class on Sep 19. It is break week as you (re-)discover your WHY based on M1 teachings! * No class on Oct 31. You will be taking massive action on your goal(s)! The official timing for each session is 9–11pm Singapore time (GMT +8), 2 hours long. The corresponding timings for other time zones can be found below, but please double check them as they may be subject to errors. Also, most regions will be resetting daylight savings in Oct/Nov which means that the timing will change in your country if you have daylight savings. The timing below is accurate as of Aug/Sep. “ Before taking Celes’ course, I was in the middle of pursuing a professional qualification to attain professional status in my field. This qualification typically takes about 2 to 3 years to complete. It was part of my grand plan to eventually set up my business. However, after nearly 3 years, I had completed only 20% of my professional course work — due to procrastination. Any excuse to take action, made with best intentions even, ran in to days, weeks and before I knew it, years. After only the first module, I left with profound realizations and my heart was singing as I completed the module’s homework. Every week (module), I made new self discoveries, gained more direction in my life and achieved more of my milestones as I went along. By Week 4, I had started tackling my qualification course work. By Week 6, I was moving along with my eventual plan of setting up my business when it is not even due for the next few years. By Week 8, I was 40% complete in my qualification course work. I had moved forward a further 20% in my qualification after just 4 weeks, when my first 20% took 3 years to complete! My qualification will be complete before end of next year and that means I will have completed the remaining 80% in just over 1 year. 20% to 100% in one year! This is just amazing progress. The funniest thing is, it’s not even hard work. It’s just consistent, positive effort… and I’m enjoying it, enjoying life! For years, I’ve read books, tried hypnotherapy, and engaged a coach to overcome procrastination. I even went to see “expert Doctors and Professors” talk about procrastination. Each time, I would leave with more weight added to my shoulders. This course has made all the difference for me. “ Before the course, I was procrastinating on finding a new job (and I didn’t know why). I felt negative, beaten by circumstances due to mistakes made earlier in life, and felt stuck in my job due to financial commitments. When I joined the course, I was only aiming to look for another job with proper work hours. Through the Anti-Procrastination Course, I realized why I was procrastinating and the course has helped me tackle my reasons, one by one. I’ve already begun researching and finding relevant jobs and have been sending in my resume, whereas before I had been delaying on this for over a year! I’ve also learned a systematic and easy-to-follow framework for tackling procrastination. This course may be about overcoming procrastination (and Celes has nailed it perfectly), but the tools she has provided do so much more than that — they guide us into living a highly productive and purpose-filled life! “ Hi Celes, I would like to share an update and good news with you! Next year, I’ll be taking on a new job which pays 40% higher than what I currently earn every month. Given that my current role is a high-level position in a top company, my current pay is great. And 40% on top of that is simply amazing. 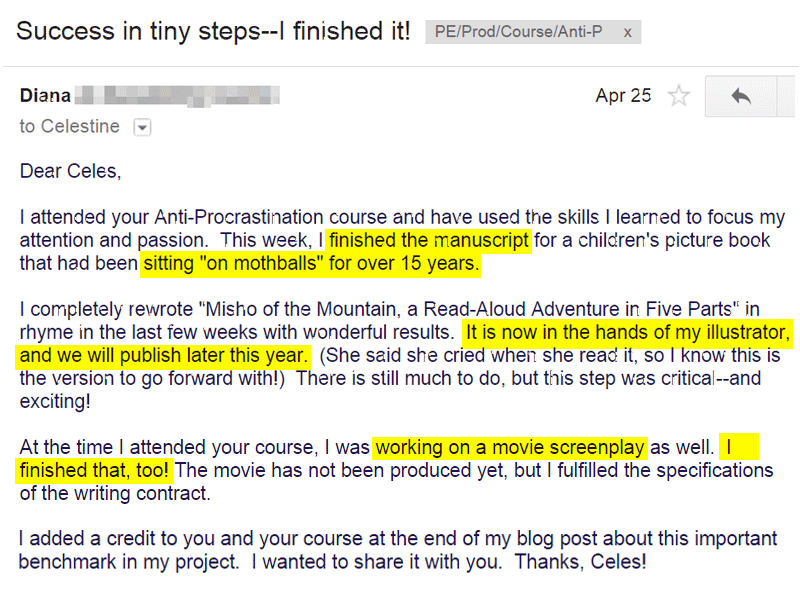 This is a testimonial on achieving unbelievable results after just 2 months of taking your Anti-Procrastination Course. While taking action on the goals I set during the course, I started looking out for jobs through various channels, specifically looking for another job with a significantly higher salary. I thought there is really nothing to lose to aim high. In the worst case, I’ll just continue looking. I am pleasantly surprised when after 2 months, I found and landed this job. “ Before the course started, I was overwhelmed with everything happening in my life… working full time in a corporate organization, bored with my day job, full-time mum to 2 kids, and on my own most of the time as my husband works two jobs and late nights. I found myself disappointed and beaten… I love dancing, was teaching a Zumba class on the side and wanted to achieve my best at teaching it and inject happiness and fun in peoples’ lives. In the very first module, when we built our desire and discovered our WHY, my vision started to form and the last piece of the puzzle emerged… a new goal was BORN!! To become a Health and Wellness coach where I combine my love for dancing and (healthy) food, and share it with the world. This goal has become my major goal now — before the course, it was hidden deep in me but it emerged after Module 1! Throughout the course, I accomplished important steps to start this journey. While I am still working in my day job, I’ve taken the biggest step: signing up for my first health and wellness qualification course… one of many certificates I will be taking to improve my expertise. In terms of health, I’m at my healthiest now: I drink green smoothies every morning, eat healthily, and exercise at least 3 times a week. I am launching my second Zumba class next month and have accomplished two more certifications in teaching Zumba specialties. Celes is very professional in her work. Her content is very deep and detailed with excellent coaching skills. What I really appreciate is how her course has been tailored weekly to the participants’ needs which in fact a lot of work for [a course of this length]. It is not just putting together a set template but adjusting it based on others’ input and Celes judgment’ on how to take the course forward. I raise my hat to that!! “ I gained a lot from the Anti-Procrastination Course. I’ve cleared a lot of my backlog tasks at work. Relationships with my subordinates improved as we get lesser tension due to the backlogs. But the best thing I’ve done is after the first week, I went out there and bought the property that I’ve been eyeing for quite some time. I’ve been property hunting for two whole years and missed a lot of good deals because I was afraid to make a move. Then I finally understood that I had let fear of the property market condition overtake my passion in real estate investment. Right now the path seems clear for me without the cloud of procrastination blocking my view. The best thing I like about this course is that the exercise and assignments of the course really makes me go out there and do what I need to do and stop procrastinating. “ I was very dubious before signing up, being a skeptical person by nature. However, I’d spent my life suffering from this debilitating mental syndrome–and feeling bad about myself because of it. Having read some very promising articles on Personal Excellence, I decided to take the risk. I had actually anticipated being disappointed or hearing the same old saws I’d heard over a lifetime of criticism from myself and others. That’s a negative approach, I know, but it’s well-founded on experience. I’d attended a few self-help classes through other providers and felt cheated. Either they were crystal-blue-persuader-we-are-all-shining-stars-let’s-sing-kumbaya sharing circles, or they were fast talking, self-promoting hucksters out to brainwash you into spending half your life savings to join their courses to save your life. Or they were just poor quality. Still, I know that participation often yields more tangible results than just reading a self-help book, so I took the plunge. Through this course, I learned that I am not intrinsically lazy and that procrastination is not my normal milieu–that it is a symptom. I learned the deep-seated causes of procrastination, which are the true obstacles that I need to overcome. Celes offered practical steps to change behavior. These steps are flexible and allow me to customize them in ways that are suited to my personality and habits. I attended your Anti-Procrastination course and have used the skills I learned to focus my attention and passion. This week, I finished the manuscript for a children’s picture book that had been sitting “on mothballs” for over 15 years. I completely rewrote “Misho of the Mountain, a Read-Aloud Adventure in Five Parts” in rhyme in the last few weeks with wonderful results. It is now in the hands of my illustrator, and we will publish later this year. (She said she cried when she read it, so I know this is the version to go forward with!) There is still much to do, but this step was critical–and exciting! At the time I attended your course, I may have been working on a movie screenplay as well. I finished that, too! The movie has not been produced yet, but I fulfilled the specifications of the writing contract. I was my own worst enemy for both these projects, and, indeed, I do fall back on bad habits sometimes, but your course helped me immensely. I added a credit to you and your course at the end of my blog post about this important benchmark. I wanted to share it with you. Thanks, Celes! “ Before taking the Anti-Procrastination Course, I was procrastinating on exercising and eating healthily. Before this happened, I was actually a very avid cyclist and triathlete. I loved hiking, trekking and climbing mountains! So when I joined this course, my initial intention was to figure why I was experiencing these procrastination. A deeper part of me wanted to know why I wasn’t enjoying these activities anymore — activities I used to enjoy. Through this course, I realized that part of the reason for my procrastination was that I had not discovered my WHY for my goals. 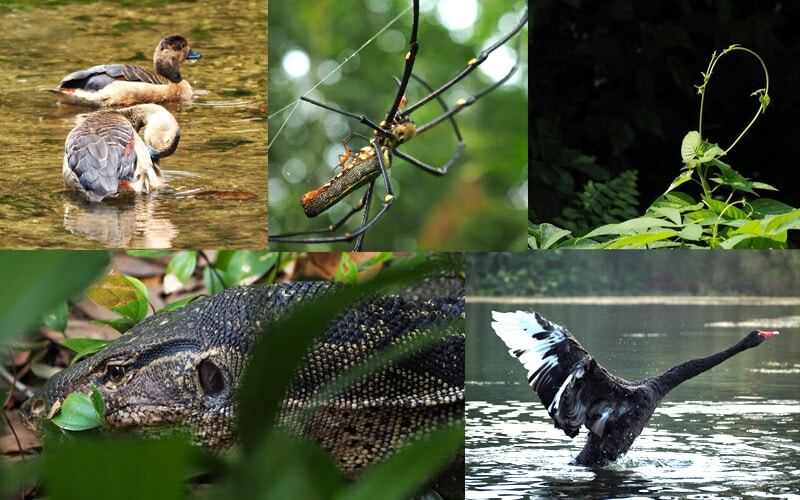 From as early as Module 1, I’ve discovered my WHY: to touch people with the beauty of our planet and its diverse life-forms so that we may better appreciate each and every inhabitant, human, animal or tree. This is not just a WHY for my goal, but the WHY for my LIFE — my life purpose. As a result, I’ve also discovered my passion in photography which I want to turn into my full-time career. I’ve been spending the past few weekends photographing in nature, and moving forward I’ll be taking part in nature photography competitions, join a photography workshop to improve my skills, turn my passion into a business, and embark on an Africa trip next year to volunteer for a wildlife conservation project. When I return, I’ll be launching my first photo exhibition and use that to raise funds for the wildlife! Celes is an AMAZING and EXCELLENT life coach who genuinely cares for our personal development. I am feel very blessed to have chanced upon her blog which led me to this course. She is a real life-saver whom I am really grateful to for having touched my life. Through this course, I’ve gained clarity on my life direction, gained an increased sense of self-esteem and self-confidence, and learned to take concrete action and set a concrete plan, along with milestones and action steps. “ The course was amazing. Procrastination had been a huge problem all throughout my life. I have always had many goals I wanted to pursue but when it came to taking action I usually found myself putting things off. Part of the reason was because of overwhelm; another reason was because I felt I would likely procrastinate again later on, so I thought, what’s the point of acting if I am going to give up anyway? This has changed after taking Celes’ course. Now, I am more productive on my goals than ever before. I’m taking massive action and I’m enjoying the work more than I ever have in the past! I’m consistently making progress each day toward my goals, whereas before, I was putting off related tasks for months. Specifically, I’ve been (1) studying drawing books/videos every day that I had wanted to do for months, (2) improving my drawing skills, (3) practicing drawing every day, and (4) writing a new article series which I think will be some of the best I have ever written. It’s exciting and I feel proud of myself. I like that the course was focused on permanent solutions to a deep-rooted problem like procrastination. It wasn’t at all about how to make to-do lists, how to organize your calendar, or how to use a tickler file. Celes’ course has helped me to see that there are deeper root causes behind procrastination that I never realized before. I understand now how I can increase my motivation for a goal, get rid of any fears I have about achieving it, set milestones I know I will be able to reach, and create an action plan that doesn’t bind me but instead inspires me. Celes was a fantastic coach throughout the course–I cannot say enough about her! She’s an incredibly intelligent and genuine person. I already knew for a fact that she is a high-achieving individual so she is exactly the right person to be teaching this course. You could really tell she was energetic and passionate during the seminar and the success of each student was extremely important to her. It is an online, live coaching class, where all participants will log on to an online meeting room (details provided after registration) every week. During each week’s class, I’ll present the week’s topic along with exercises that everyone will work together and share their answers during stipulated sessions. Throughout the class, you will get to interact with other participants via text chat and post related questions (which I’ll answer live). 3 things you need for live classes: (1) A computer, (2) A high-speed internet connection, and (3) External headset+mic (for voice sharing sessions during exercises). All sessions will be recorded, and links to video recordings and slides will be sent 48 hours after every module. There are some clashes between the course schedule and my calendar. What should I do? Don’t worry! I will be providing recordings for attendees who can’t make it for specific weeks. Each week’s recording would be available for viewing right up to the end of the course. This is to help the participants who have engagements that clash with the course schedule. I do request that you do your best to attend the live classes in order to get the best results, and for the classes that you miss, to watching the recordings plus do the homework before the next class, so that you get the best out of this course itself! I’m lazy and often unmotivated. Can I really get results? Let’s put it this way: if you intend to join the classes and commit to the course work, yes. If you intend to sign up without the intention to commit to the classes, then no. At early as Module 1, you’ll learn that your laziness and lack of motivation are symptoms, not issues. The root issue of your procrastination is something else. This is what we are here to uncover through Anti-Procrastination Course. However, if your “laziness” is so bad that you can’t even turn up for the classes that have been specially catered to help you bust your lack of motivation, then this course isn’t for you. I suggest you engage some other resource. What’s the difference between the product and this live course version? With the product, readers purchase the courses and work on the material in their own time. It’s 100% self-administered. No support at all. With this live course, we work through the course materials together, in real time, with participants from all around the world. You will work on a specific goal of your choice, create an action plan for it, and work on it throughout the course. During each week’s call, you will work through the course content with respect to your goal plus get direct Q&A support from me. In addition, for this year’s run, I’m introducing a private Facebook community to drive participant engagement and 3 additional group coaching calls that weren’t in last year’s run. These group coaching calls will help us do further deep dives into your procrastination, follow up on your progress, and ensure you are set for success. These are all not in the product version. I have limited funds. Can you let me in free / give me a discount? Quite frankly, the ticket prices I’ve offered are my best rates to justify my time and work involved. There are significant costs and time involved in creating/conducting a course and it’s not possible for me to discount my rates or allow free access. Honestly speaking I don’t think you can find a course of this length and design out there at this price at all, and I’m not even getting into the quality of the course itself. Many self-help courses out there are based on generic tips that barely scrap the surface — tips that you can either Google or pick off some book in the self-help section of a bookstore. 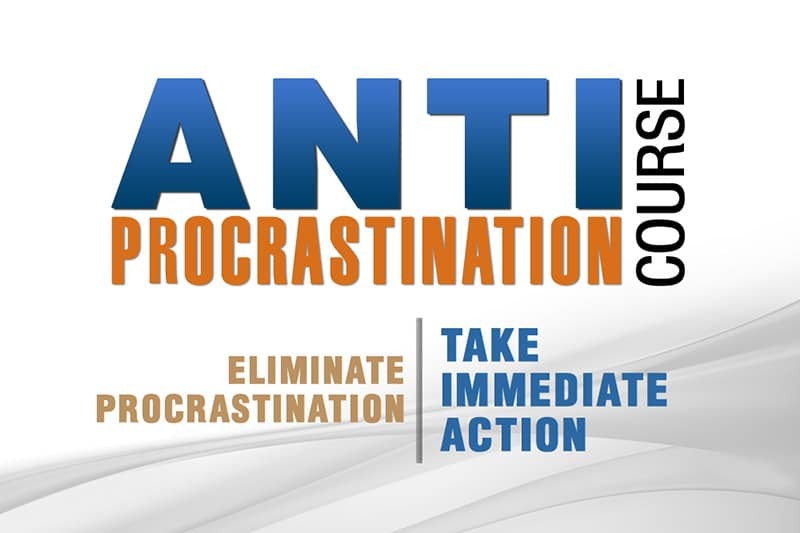 Anti-Procrastination Course is a complete, original system that I designed myself to combat procrastination — with proven results. The results of my participants don’t lie. I understand that not everyone can afford (or is ready) to pay for courses, which is why I’ve invested so much of my time to provide free materials at PE. If money is a concern, check out my free articles on productivity. For those of you who have spent years working on your growth and are now ready to take things to the next level, this course is for you. Is this year’s run the same as last year’s course? I’m always improving my courses and push them to the next level so as to offer the best quality material to my participants. Last year’s AP course was a 100% expansion and significant upgrade to the material vs. 2013’s run. This year’s course will be a fine-tuning of the existing curriculum with more examples, along with 3 additional group coaching calls AND a new private access community where participants can share results, continue discussions about the classes offline, and take their goals to the next level. I’ve bought the Anti-Procrastination Program (product version) and I’m ready to join the live course. If you have bought the product version, you get to attend this course at a top-up fee, which is the price of the live ticket minus whatever price you paid for the product. You will find the live experience much richer than viewing a video recording because you get to interact with the participants, do the exercises live, share your answers, ask questions, and get instant feedback. Simply let me know your interest to join the live course and post the transaction number for your product purchase in the comments section and I’ll send you the top-up link via email! You are a paying member of last year (2014)’s course. Due to limited seats, alumni access will only be offered on a first-come-first-serve basis up to a quota. The free ticket will be the equivalent of the BASIC tier (see below on the course tiers). For alumni interested to take up the 1-1 coaching tier, you can do so at a top-up fee that is the difference between the GOLD and BASIC tiers. Simply let me know your interest for the top-up in the comments section! Update: All alumni slots have been redeemed and there are no more alumni slots available. Thank you for your interest! The Anti-Procrastination Course is a rigorous 3-month course where we will work together to achieve massive results in a chosen area of your life. Through this course, you will be taking real action on your most important Quadrant 2 goal of your life. By the end of the course, you will find yourself a master action-taker, having busted your false procrastination beliefs and worked through your personal blocks preventing you from action. Imagine a life of no procrastination. You’re able to take action whenever you want… be it exercising when you want to, studying whenever it’s time to hit the books (without any resistance), working when deadlines call for it, taking due action to write your book / create your business plan / work on your blog / work on your latest project, etc. every single day without putting things off. How much would you achieve in such a life? How accomplished would you be? How fulfilling would your life be? To me, such a life is priceless. The full Anti-Procrastination live course, spanning from Sep to Dec. There will be 11 x weekly online group coaching sessions to break through your procrastination barriers, create your personal goal plan, and take massive action in your goal. Access to video recordings & slide presentations. All slides and recordings will be shared 48 hours after each live session. You will be able to view the recordings right up to the course ends. Through the Anti-Procrastination Course, you get the complete framework to bust procrastination, live coaching attention, Q&A, and community support to bring your goals to fruition. I’ve been doing this for 7 years and I’m not going anywhere. I look forward to work with you hand-in-hand to bust YOUR procrastination issues, once and for all. Are you in or out? “For years, I’ve read books, tried hypnotherapy, and engaged a coach to overcome procrastination. I even went to see “expert Doctors and Professors” talk about procrastination. Each time, I would leave with more weight added to my shoulders. This course has made all the difference for me. Update, Sep 8: The class is over three-quarters full with participants from US, Canada, Holland, UK, Sweden, Spain, Singapore, Malaysia, and Africa registered so far!!). Update, Sep 9: Less than 48 hours before registration closes. Registration will close on Sep 11, 12pm EST sharp or when seats are full. REGISTER NOW to confirm your seat.